EffectiveCos: Congrats to our 2012 World Cosplay Summit US Representatives! Congrats to our 2012 World Cosplay Summit US Representatives! 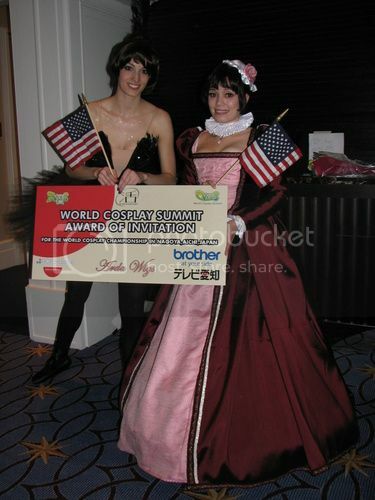 Huge shout out to Katie & Diana on winning the US preliminaries for a spot to compete on behalf of our whole country at the 2012 World Cosplay Summit! For those unaware, the World Cosplay Summit is an international cosplay competition hosted by Japan's TV Aichi. The event's goal is to promote positive international relations through Japanese pop-culture & cosplay. In the months leading up to the event, the participating countries hold preliminary rounds in order to each select a team of two representatives to compete at the main event in Nagoya, Japan. The US has only one preliminary round, which was this year held at Katsucon. 22 teams presented on stage and were judged by a panel of past WCS representatives. Even before the judging, many viewing the competition via UStreem picked out Katie and Diana as favorites to win. Their performance was truly exemplary of what it is to create a high caliber cosplay skit, and their craftsmanship was of equally stunning quality. They presented as Rue (Diana) and Princess Kraehe (Katie) from Princess Tutu. I have not read or watched Princess Tutu, but what I know (which is an important element of this skit) is that Kraehe is in fact the alter-ego of Rue, that is to say they are technically the same person. Once announced, the lights came up with Rue standing beside a curtained mirror. As she is looking elsewhere, suddenly a figure appears behind the glass--Princess Kraehe! The two play a game of visual cat and mouse for a time: Kraehe only showing herself when Rue's back is turned, and Rue nervously trying to catch the vision she can't be sure she's seen out of the corner of her eye. Suddenly Kraehe emerges from behind the mirror. She dances about menacing Rue. As Kraehe dances, Rue seems to come under her control, alternating between puppet-like movements and moments of despair, until she collapses in defeat. Triumphant, Kraehe sends Rue into the mirror, and closes the curtain. The idea of alter-egos competing and locking each other in a mirror is far from new, but done with such care and polished movements it can still be incredibly effective. The scene was underscored with suspenseful music which was well cut and choreographed to in order to highlight each moment in their story. Their set piece was amazing as well. Whatever they used for the mirror was actually reflective enough to see Diana's reflection, but transparent as well so that with only back-lighting Katie could be clearly seen on the other side. Also, as one would hope from a Princess Tutu skit, Katie is clearly a classically trained ballerina (note NEVER go on point for a costume if you are not trained--without the training to build skill and muscle you can REALLY hurt yourself!). Finally, the sharpness of their movements is evidence of lots of practice. To view this, and other skits from this year's WCS preliminaries, check out ACP's Katsucon Video Page. Those with ACP accounts should be able to view High-Res videos, or for those without Low-Res videos should be available via YouTube in about a week. Congratulations again to Katie & Diana!! !